Cloth Diapering FAQs (from a Newbie for Newbies) | House Unseen. Life Unscripted. I got a couple of Thirsties products in my free stash(es) and I really like them so far. The quality seems good, they're soft on the squishy baby skin, and they have the cover and insert style available, which I prefer, for some reason, over the all-in-one diapers. 2) With the Thirsties, it seems like there are several options to choose from. What's up with all that noise? Note the awesome leg gusset right there that keeps the leakies at bay. I also thought I'd prefer snaps over velcro but I was wrong. The velcro is totally adjustable depending on baby's size, whereas the snaps (which I have on other brands) are at pre-set intervals, so you might have several days where the diaper is either too tight or too loose but you can't get it in between. This cover is basically just a waterproof shell that you can put over any absorbent anything that you want to put inside. Old fashioned cloth diapers (aka "pre-folds")? Check! Schmancy microfiber inserts? Check! Things made by other brands? Double check! 3) Have you had problems with the adjustable snaps popping open? How about the velcro - does it seem to be holding up? So far, no problems with either snaps or velcro. I just prefer the velcro for the adjustability. 4) What type of liner do you prefer? Seems like there are tons of styles to choose from. I like the fit, the softness, and the absorbancy. 5) Do you wash the wipes with the diapers? Does it seem to be overwhelming from a laundry perspective? And the last one for right now (sorry) do you use a different detergent for the diapers and wipes, or just the same one you use for everything else? I wash the wipes and diapers together and so far the laundry hasn't overwhelmed me. My girls do help out a lot though and we do a load of laundry almost every day. First I dump the contents of the wet bag (the waterproof bag holding all the ooey gooey diapers) and the wet bag itself, inside out, into the machine. Toss in some Oxy Clean, and start a rinse/spin cycle. After the first 2 minutes, I pause the machine to let the diapers and wipes soak. I trot off and do other chores for a random amount of time. Then when I remember the laundry, I restart the rinse/spin cycle. When it's over, I throw in the rest of our dirty clothes and do a regular wash cycle. All cold water still, but so far no problems at all. equal parts Borax, Washing Soda, and Oxy Clean into a container. Shake to mix. Voila! I use 2 T. for every large load and white vinegar in place of bleach and fabric softener. I hang all my laundry outside to dry. So far, everything has looked great. Alright, hope that helps a bit! Feel free to ask me any questions, but keep in mind that I am brand spankin' new to all of this too. But I do like it, so there's that. Perhaps these are the things you wondered about pre-Mary, and now you know the answers? I'm almost 2 years into the cloth diaper gig and it's still going well. I'm glad that it's been easy for you. One little thing to watch out for, though -- those microfibre inserts are a little TOO absorbant and will wick moisture from a baby's skin, You'll want to put a layer of SOMETHING in between them and the tush. Ok, I am a new cloth diaperer and am using the microfiber. What should I put between them and skin? I've heard something about wicking and am not sure what it even means. Now re-commenting to add: I have Softbums, which are microfiber on one side and fleece on the other. The fleece is against the baby's skin, so maybe that's what you mean. Yes, fleece against the skin is the way to go. You're all set! Awesome post. You have almost convinced me to go back to mostly cloth. Do you have a front loader, Dwija? 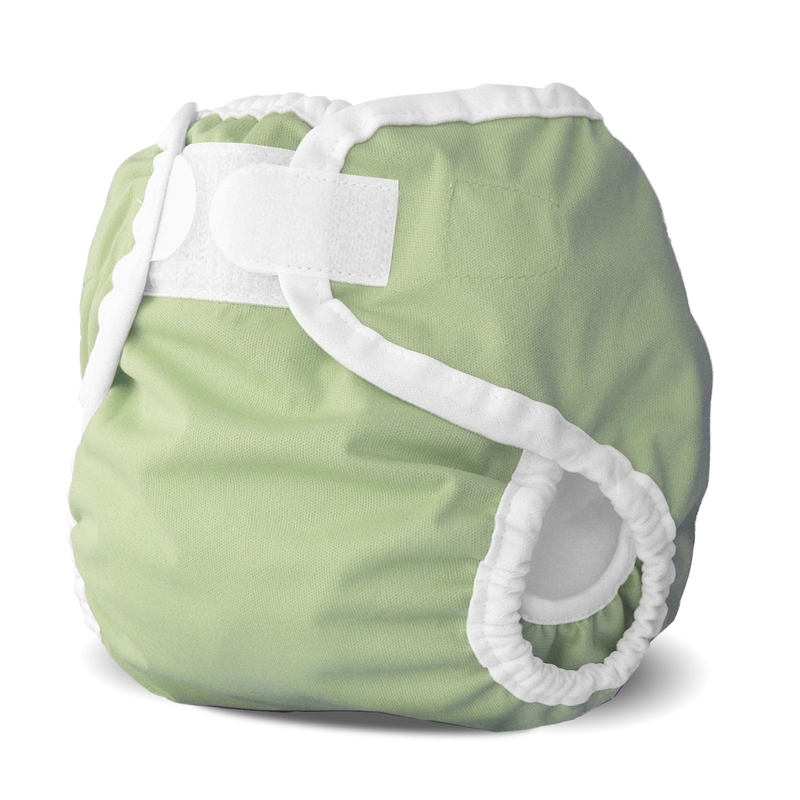 I'm going to try cloth diapering with Fuzzi Bunz, diaper covers and inserts but am concerned about the ability for the FL to clean them. Yep, front loader. It's worked fine so far with the pre-rinse + oxy clean. I'd say give it a try! p.s. I see you've revealed your true identity. Yay! When I cloth diapered, there was an actual service that came and took the stinky ones away and brought me clean folded new ones! Loved it! Here's a question from "Mars": How do husbands like cloth diapers? Do you find that Tommy is spending...like...a lot more time outside, as far away as possible? My husband loves that we save about $1500-2000 per child by cloth diapering. He doesn't mind changing them because they're really not any harder. The cleaning/folding takes about an hour a week total (I added up the minutes from all the washing/drying/folding). So, since using cloth diapers saves about $20/week, that's a post-tax wage of $20/hour. I do better working, but 1.) a lot of people don't, and 2.) I'd have to work a lot more if I didn't do stuff like this to make our budget stretch. We'd rather pay down our mortgage faster. Before our first child was born, my husband did reserve the right to not like them and refuse to do them. I reserved the right to smack him upside the head and remind him that generating about 2 tons of filthy refuse per child is not a right, and that since he had no prior childcare experience, he would hardly know the difference. Now he's Mr. Super Dad and wouldn't even think to complain about changing diapers or washing them. His dad bragged that he had "never changed a diaper", despite having four kids. I gave him a level look and said, "That's nothing to brag about." The apple did fall pretty far from the tree in my husband's case, thankfully. I used to cloth diaper until I discovered Target brand diapers (up & up). You can order them online and have them shipped to your house for free with a Target redcard. It is $20/month for diapers which I think is super cheap & worth not doing extra laundry!! You are making me want to go to cloth diapering as well. As if I need to add more to my plate. HA! I still have one in diapers and am adding another "dependent on parents for all my pottying needs" child in about a month. That might be TOO crazy to try... I doubt my husband would like it either. We cloth diaper our one year old and as far as I'm concerned, a diaper is a diaper. My husband is just as capable as I am when it comes to getting diapers on and off the wiggly boy. He is even smart enough to push start on a washing machine. My sister used Green Mountain diapers for her twins this year (still does) and loves them. Her wash experience sounds like yours. One load a day and she has no problem keeping up. My best friend is having her 4th soon and is going to try the cloth (purchased the outgrown set from my sister). My how cloth diapers have changed in the two decades plus since I diapered my three in cloth, using safety pins and plastic pants. Sounds way easier now. Would you believe that this is the FIRST cloth-diapering post that has ever made complete sense to me? I've always been baffled by the whole concept for some reason. But this! It looks totally do-able! Just an aside to the conversation. I'm still doing the fold and pin. Last year at the little Catholic college my daughter attends, she taught her guy friends how to fold the oriental diaper fold using tea towels while they were doing kitchen duty. All the padding down the middle, one pin in the center. She started a tradition. Now the guys are teaching the new guys. It's all the rage. I really like diapers I fold myself. Diaper folding is very therapeutic. All my kids were cotton-bums and they all learned to fold by the age 6 or 7. Keeps 'em busy. I am so glad cloth diapering is working so well for you! We order our cloth diapers next pay day! This week (2-week period) we bought our "nursery in a box" for way more money than I think it "should" cost for such things, but since buying a used crib is prohibited in Washington state, it was a "necessity". We may even get prepared for this little man before he's here in just over 10 weeks! In contrast, during Hurricane Ike, we used the diapers that came from a diaper cake a friend gave us - Huggies leaked like crazy and we had constant blow outs at the back. Pampers were okay, but still leaked. We washed our cloth diapers with unscented Oxyclean and Charlie's Soap. I tried using some cotton washcloths as wipes, but they were terrible - unabsorbent, mess smearing, and completely ineffective. So I bought Lansinoh wipes and just washed the dirty ones along with the diapers before throwing them away. It left a little more lint in the dryer screen, but not too much. It's too bad I can't keep a bun in the oven, I have all these nice prefolds and no one to diaper. I wish I would have done cloth diapering with the first baby...now it's too late, but good for you!!! Dwija, this is awesome. Thank you so much!